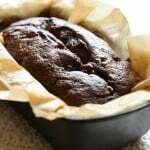 This recipe is for the best chocolate zucchini bread recipe! Stir in shredded zucchini. If really watery, squeeze out excess water. Allow to cool on a cooling rack and serve. You can also serve warm too. The pictures in this post were made with mini loaf pans.